Father’s Day is closing in on us. And while I love to talk about baseball and my dad (see a reprise of my traditional Father’s Day essay here), my dad really was all about the Sport of Kings. That’s right, horse racing. And you can bet he’d have something to say about what happened to California Chrome last weekend at the Belmont. But allow me first to wax on about Dad. 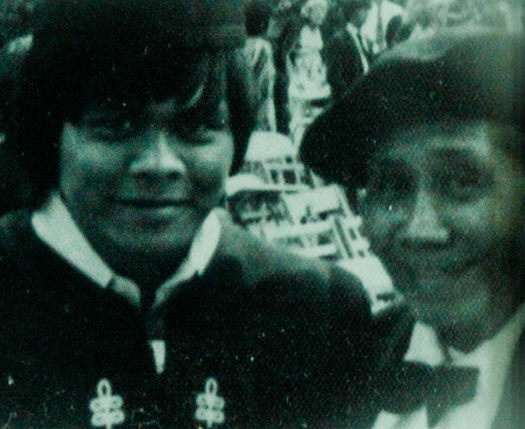 My father, Willie Guillermo, was one of the first immigrants from the Philippines to the U.S. in the ’20s. He was one of those guys who saw America as worth dressing up for. He liked to wear suits and ties and a fedora, just to make sure he got noticed. This was a time when more Filipino men than women were allowed to immigrate to bolster the U.S. labor force. There weren’t any women. Combine that with anti-intermarriage laws and to have a family was the impossible dream. Like salmon spawning, it was an uphill fight. Sometimes in a bachelor society, it was enough to dress GQ and splash on some Old Spice, just to feel good. It sure was safer. In California in the ’30s, dating a white woman could get you killed. Just think, if my dad got lucky back then, he would have been shot. Or I would be close to 90 years old now. I can thank racism for something. For the bachelor Filipinos in my dad’s group, the racetrack was their social center. At Bay Meadows in northern California, there was always the possibility of an orgiastic win at the track. That’s what Filipinos and a few other Asian immigrants did. They gambled on America–despite the Depression. It was all better than the life over there. And when most of the jobs were limited to the kitchens and fields, the answer was always the races. That is, if you had the smarts to read a Daily Racing form and bet on something more than your favorite number. That was my Dad. In 1930, he saw Gallant Fox, the second Triple Crown Winner. In 1937, there was War Admiral. But the local favorite at the time wasn’t even a Triple Crown winner. It was the Bay Meadows champion, Seabiscuit. My dad was hooked on the equine arts. It wasn’t until after WWII that my father married a Filipina bride, and I was born. And when I was old enough to play ball, I’d go to the park alone. My dad was at the track. One day, he even made it into the newspaper, in the only section my pals and I would read–the Hearst paper’s sports page. There he was pictured on the front of the section in his fedora, looking at the Daily Racing Form, leaning on the rail. Ornithologically, it was correct. And he carried around that yellowed newspaper clip in his wallet to the day he died. I just know had he been alive, he would have been all over California Chrome’s quest to be the first Triple Crown winner in 36 years. But in my dad’s day, thoroughbreds were sound and didn’t need drugs. They raced clean. Or at least cleaner. No legal drugs like Lasix, used to mask possibly other drugs. It was a very different time. And maybe that’s why racing is an oft-forgotten sport that has fallen into ill-repute. It exposed once and for all what my father’s equine dream had become. But the investigation was overshadowed in the last few weeks when the feel-good story of California Chrome attracted more people to racing than ever. In the end, it only masked some of the real need for reform in the sport. After the race, when California Chrome lost by less than two lengths, it was obvious to me that Chrome’s jockey had given the horse a bad ride. Instead of using Chrome’s speed advantage, the jockey, Victor Espinoza, sat back on the rail, then moved 4 wide to the outside. At that point, the horse just ran out of gas and couldn’t catch the winner, Tonalist. And that brings us to the bombastic Steve Coburn, the cowboy-hatted Wilfred Brimley lookalike who is co-owner of California Chrome. He went amok when his horse lost and called the winner and its connections “cowards” for ducking the first two races of the Triple Crown. Tonalist came to the Belmont fresh and consequently spoiled Chrome’s chances for eternal greatness. Coburn was a bit ungracious, but he did speak some truth. In his rant, he was at least sincere and honest, much more so than in his profuse apology on Monday to re-ingratiate himself with the public and the leaders of the doomed sport. He really didn’t have to. Many horse people are advocating reforms, such as longer rest times between the big races so that horses of today–frail, one-dimensional, and often bandaged up to run–can mount a legitimate challenge to the Triple Crown. The breed is overall in such poor shape that the grueling pattern of three races of increasing lengths in five weeks may as well be the equine version of the Bataan Death March. California Chrome will need at least a few months just to recover from his Triple Crown Fail. After racing on the legal drug Lasix, a diuretic, he lost more weight than normal. He got clipped in the hoof and suffered a quarter crack. And then there’s the fact of being whipped 23 times in the stretch in a losing effort. A legitimate Triple Crown champ harkens back to a time when the breed was strong, and Asian immigrants, like my dad, flocked to the game and saw it as their opportunity to bet on legitimate champions. From 1930-1948 (18 years), there were seven Triple Crown Champs. From 1949 to the present (65 years), there have been only three. My dad is long gone, and maybe it’s time for the game to end too. If the feel-good story of Chrome doesn’t lead to substantial reform, then the romance of the railbirds is lost forever. And all that’s left is a cruel and ugly anachronism.